Bible Verse: Footprints 2 - Any verse. This inspirational bible verse gift includes the Footprints 2 art background and is shown with one of the most popular Christian verses John 3:16 from the King James translation. You can, however, choose any Bible Verse (example: John 3:16) and your Preferred Translation (example: King James) by entering your preferences in the input fields below. If you prefer to receive the gift exactly as shown you do not need to enter the verse or translation below. Your bible verse gift includes a crystal clear protective sleeve which protects it from dust and handling. The art lithograph used to create this gift is acid-free, 8.5x11 inches, and is suitable for framing with any 8.5x11 document sized frame. This is a beautiful family heritage gift based upon your family's country of origin. Provide us with your last name and the country where your last name came from and we will create a very special gift that includes many interesting and complimentary facts about your family heritage. Pass down your family culture and heritage to your children with this unique gift. Please enter the LAST NAME and COUNTRY of ORIGIN for the last name below. A one-of-a-kind French Heritage Keepsake personalized with the family name of your choice. 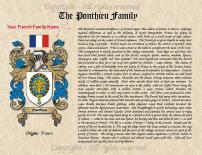 This unique gift will also include the French Coat of Arms and country flag along with numerous interesting and complimentary facts about your French family heritage, including many notable insights that you may not have been aware of. This precious keepsake was designed to pass down your French family heritage to your children and grandchildren. A gift that will connect your family with their roots and instill cultural pride. A keepsake that is sure to become a cherished family heirloom. A one-of-a-kind Italian Heritage Keepsake personalized with the family name of your choice. 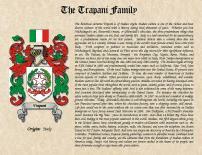 This unique gift will also include the Italian Coat of Arms and country flag along with numerous interesting and complimentary facts about your Italian family heritage, including many notable insights that you may not have been aware of. 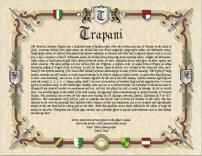 This unique keepsake was designed to pass down your Italian family heritage to your children and grandchildren. A gift that will connect your family with their roots and instill cultural pride. A keepsake that is sure to become a cherished family heirloom. Your keepsake measures 8.5" x 11" and arrives in a protective art sleeve. ENTER the Italian LAST NAME below then press ADD TO CART to complete your purchase.